As of late, I have been in deep thought and questioning what my ultimate role is within my career focus. So today I want to tell you about my critical, resultant thinking. Recently, I have gained a greater appreciation for the fragility of life and how short time really is. It seems like yesterday I was graduating University, yet now I find myself making professional career oriented choices. With that being said, I am telling you, do what you want to do. Be who you are and whatever that it is your doing; do it! Do not hesitate to become that person you wish to be by making professional, methodical decisions. Be proud of your decisions and stand behind them! I recently read that in order to achieve success in this world you must speak loudly through action. Taking action within your life in terms of dietary intake or in your physical activity bouts all require time and energy. Therefore, I believe we should “hustle”. Hustle hard in whatever you do in your life. If you are a carpenter, hustle at it. If you are a teacher, hustle at it. If you are eventually going to start hitting the gym, stop reading my blog and get yourself to the gym. Hustle it folks. Ghandi nailed it when he said, “Be the change you wish to see in the world”. I live by these words and they appear on my iPod when I turn it on every morning. Be strong and be confident. Michael Waltrip; a Nascar driver, wrote in his book, “Never take any day for granted” when reflecting on his youthful days. Michael goes on to talk about how that time in his life he had it all. He was #winning at every level of stock car racing and was rolling in the money. However, he never forgot those kind words a stranger on one of his traveling adventures told him, “Never take any day for granted”. Every dog has his(or her) day. So go out to your job, either as a student or a professional and take charge of your life while you can. Ultimately time is short; life is finite and the quality of your journey through a life of wellness depends on your proactive “hustle”. YOU can be a blogger. We all have opinions and ideas running through our minds each day which we use an online journal to express those ideas. However, at a rural middle school, one teacher is transforming student journaling into an online blog-like format whereby students can express themselves in a safe, educative way online through the school board website. After thoroughly looking through this setup, I realized that this is an AWESOME thing which can transform education paradigms. The students who are piloting this e-journal are continuously awaiting new postings, books, journals and discussions as it mimics the Facebook type of social network. Bringing the classroom to life online, students are becoming engaged as late as 9:15pm and up early to see if other postings were put on in the late evening hours. They are constantly excited about what they are doing and about possessing their own blog posts online within the education board website. Now, your probably wondering how this is related to health and wellness... Well, education and affiliative learning is essential in sustaining social wellness and well being. Your ability to express yourself in any situation, verbally or written, is directly related to your individual wheels of wellness. This is a shift in thinking which I can see for the future development and well being of our students. We are trending into the blogosphere and moving away from hand written journals in school. I see this as a great thing as students become more aware of the positives of social media and how it can promote educative learning within their lives and spheres of influence. This can also allow them to be able to seek out good information and how to post it, write about it and analyze it in its entirety. Whether it is a book or an experience, students are leaving this school with the skills and ability to express themselves in a safe, effective way online! Well folks, it is great to be back on blogging trail again. Today I will try to focus on one topic, one person and one book which has added much significance and passion to my love for teaching, training and entrepreneurship! In my Elementary Phys. Ed course there is an awesome individual who brings much to the table. He often shifts my thinking, as well as that of many others, inspiring people all over the world, and making everyone he knows smile or laugh. This man's name is Gary Gray! Now, GG has started something fantastic which I recently heard about and I thought I should share that with all of you. BE......AWESOME! After attending one of GG's sessions on how to become a better individual and how to strive for higher standards within your career, I was very empowered. GG has a lot to offer everyone! He is inspiring people all over the world through his website [http://www.thacolorgray.wordpress.com/] and challenging his followers to pick up their bottomless knapsack each day and continually strive to fill it. Through his website he dares you to try new things, help other's and most importantly he challenges you to think creatively and authentically while habitually using mindfulness. GG also recommended an amazing book from which his website and BE AWESOME campaign has flourished. 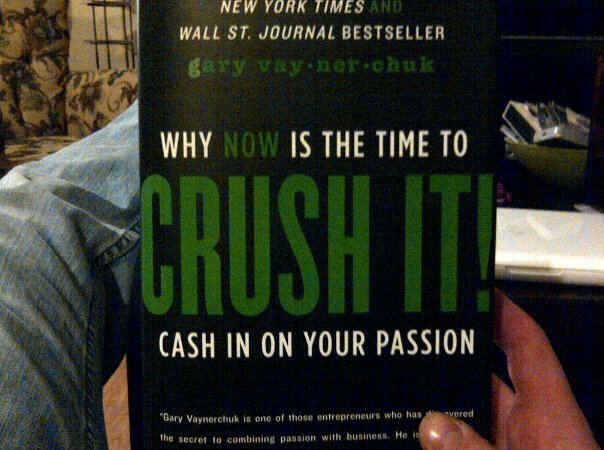 This book is titled, "Crush It" by Gary Vaynerchuk. So, the other day I strolled into a bookstore and found the book (only one left in the entire store) and bought it. This book is extremely powerful in helping you change your way of thinking about business and success. 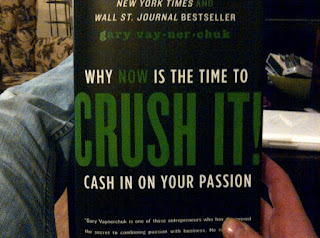 Vaynerchuk challenges each one of his readers to dig deep, push hard, work hard and do what you do admirably. In other words he means, "BE AWESOME". I have since been inspired by this book and if you can find it, buy it and then read it. If you want to become awesome at what you do, I challenge you all to a) check out GG's website mentioned above and b) Pick up the book, "Crush It". By learning from GG and the book I am reading, I now realize that there is no secret formula to becoming awesome. If I could explain it to you in simple words, being awesome is about having the right people with the right education with the right ideas talking about the right things, which leads to the right results! Good day folks. First of all, I want to thank all of you for habitually checking my blogs. From Croatia and Kuwait to Korea there have been viewers checking in from around the world. I am glad you find my postings interesting! Keep following! Now, lets get into today’s topic. Peanut butter. Peanut butter is awesome folks. I apologize if any of you reading this blog has a peanut allergy! But, if you do not have a peanut allergy, I encourage you to start consuming peanut butter. Now, there are many types of peanut butter out there so I am going to help you make smart pb choices. There are low fat pbs, regular fat pbs, omega-3 enriched pbs, natural pbs and even whipped pb (which is terrible, I tried it). Being a pb fanatic, I have had my share of pb taste testing. However, when it comes to health and wellness, sometimes taste needs to take a back seat to health. I have tried the icing sugar filled pb myself, being conned into the idea of it having less fat but I ultimately found that I was somewhat addicted to THAT particular type of pb. When I started feeling this way I looked at the ingredients and saw the icing sugar content. I realized at that moment that I was addicted to the “high” or “sugar rush” which low fat pb was providing me! Grrrr! So, I switched! Low fat pbs often have icing sugar listed high on the ingredient list and often contain more sodium than the regular fat pbs. This icing sugar gives you a blood sugar spike similar to when you have frosting on a cake. Therefore, logic would conclude that low fat pb should be labeled, “Low fat pb icing”. HAHAHA. Next up is you regular or often “smooth” fat pbs. These pbs are often not filled with icing sugar but have a higher fat quantity than the low fat pbs. With that in mind I say, pick the battle you want. Fat or sugar? Fats from pb can provide you with more energy and not give you as high of a sugar spike as does the low fat pbs. However, there is still a better option! Natural pb! Natural pb! 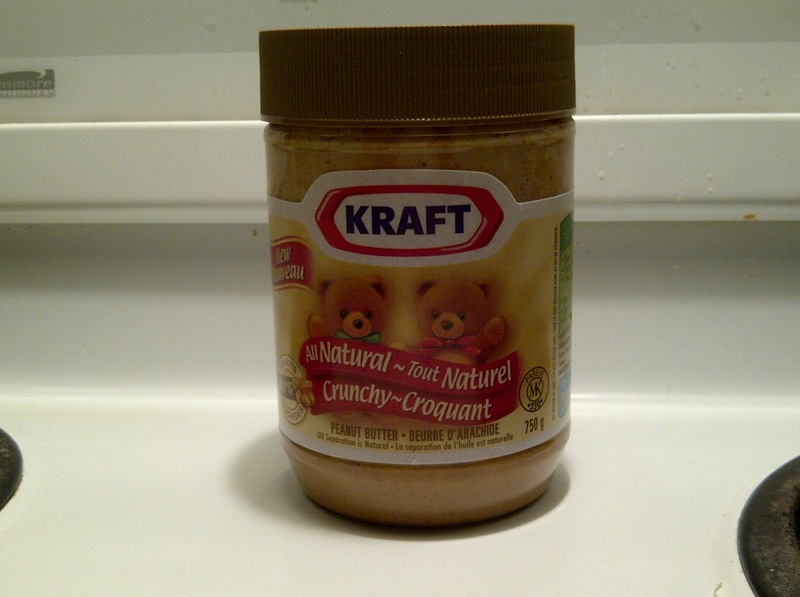 Natural pb usually contains 100% peanuts and is often higher in fat that the more manufactured types. However, natural is the best. Anytime you can consume something that is more natural than something else it should logically be better for you (in terms of nutrition and food intake). Natural pb often contains fewer carbs and sugars than the other types I mentioned above. I have attached a picture of Kraft natural pb so that you have a visual guide when shopping! Check out this link to a TED talk about how unsustainable we seem to be. It makes you question alot of things, including your own personal philosophies. Stay educated! Hey Folks. Here is a video of me doing a rotator cuff, shoulder, ab, back and core exercise all in one. This exercise is called the standing shoulder swing and you can do these anywhere with a dumbbell, log from a fire, a medicine ball, your cat or a 45 lb plate like I am using. Be sure you pull up from the shoulders while maintaining a tight core throughout the movement. If you look closely you will see my Quads contracting on the way up. This reiterates the using of both your lower and up body in this compound movement. Also, keep your head forward so that your spine remains aligned. Start light and try for some high reps! Enjoy the video. Keep healthy and continually follow my blog!